Today's lofty asset prices are dependent on one thing far beyond all else: continued massive amounts of liquidity injected each and every month by the world's central banks. This makes the future price trajectory for stocks, bonds, real estate and nearly every other asset class more dependent on central bank policy than at any time in history. Investors need to ask: What are the central banks most likely to do next, and what will the repercussions be? We here at PeakProsperity.com are particularly concerned about the central banks' next actions, as we believe their policies are creating the greatest wealth transfer of all time -- from the hard-earned savings of the public, and into the pockets of an elite few. (More on our conclusions can be read here). Which is why, via our brand-new webinar platform, we're giving you insider access to several of the world's top experts on the central banking system, world currencies and financial markets. During this 3-hour webinar, you'll hear their latest intelligence and forecasts AND be able to ask each speaker questions directly. This will be an amazingly rich and interactive experience. Asset price bubble risk -- How big is it now? Central bank intervention, both clandestine and overt, in world financial markets -- What are the implications for price discovery? Rising interest rates -- Will the Fed raise rates on June 13th? The Fed's endgame -- What long term outcome is Fed trying to engineer? The even bigger picture -- What are the goals of the global central banking cartel? How to protect our wealth -- Which investment strategies offer protection against central bank meddling in (and quite likely, destabilizing) markets? This is a not-to-be-missed experience for the prudent investor. And is being offered at tremendous value. Normally, registration for a 3-hour event with speakers like these would cost hundreds, if not thousands of dollars. Of course, you'd also need to add to that your travel costs of getting to the event. But through our new webinar platform, we're able to offer this to you for just $50. Plus, you get the chance to ask questions directly of the speakers. And there's no need to leave the comfort of your chair to enjoy the experience. So, register today, and secure your seat for the webinar. We've assembled an all-start team of speakers for this webinar, which will be moderated by Chris Martenson (who will also give his own presentation). David Stockman - David Stockman is an insider turned iconoclast. He began his career in Washington as a young man after being elected to the U.S. Congress, and quickly rose through the ranks of the Republican Party to become the Director of the Office of Management and Budget under President Ronald Reagan. After leaving the White House, Mr. Stockman had a 20-year career on Wall Street. Axel Merk - Axel Merk is the President and Chief Investment Officer of Merk Investments, manager of the Merk Funds. He is an expert on macro trends and his investment advisory firm offers funds and advisory services on liquid global markets, including domestic and international equities, fixed income, commodities and currencies. G. Edward Griffin - Ed Griffin is a researcher, lecturer and film maker, and author of the book The Creature From Jekyll Island, the exhaustive and definitive work on the formation of the Federal Reserve. In addition to his expertise on the Fed, he is also know for his coverage and commentary on international banking, terrorism, taxation, U.S. foreign policy, cancer, the Supreme Court, and the U.N.
Chris Martenson, PhD - Chris Martenson, PhD is an economic researcher and futurist specializing in energy and resource depletion, and co-founder of PeakProsperity.com (along with Adam Taggart). His work focuses on the interconnected forces in the Economy, Energy and the Environment that are shaping the future, one that will be defined by increasing challenges to growth as we have known it. New Harbor Financial - New Harbor is an independently owned, fee-based registered investment advisory firm that provides hands-on investment management and custom-tailored financial guidance services for individuals, families and institutions. The firm's investment outlook takes into account the themes discussed at PeakProsperity.com. The program for the webinar will be as follows. Each speaker will use their last 10 minutes to answer questions posed live by the webinar audience. Noon EST -- Chris Martenson, Master of ceremonies for this event, will open the webinar by setting the overall context: The global economy is unsustainable, and has a mathematically-inevitable date with a major breakdown. The following roster of speakers will explain why, as well as present ideas for safeguarding your wealth from the coming correction. 12:05pm to 12:40pm EST -- G. Edward Griffin will explain how a private banking cabal gained control of America's monetary system through the formation of the Federal Reserve, and how it has since metastasized to control the financial and political systems as well. A massive wealth transfer from the public's pockets has been the result, and will continue until the system is bled dry, just any parasite left unchecked will kill its host. 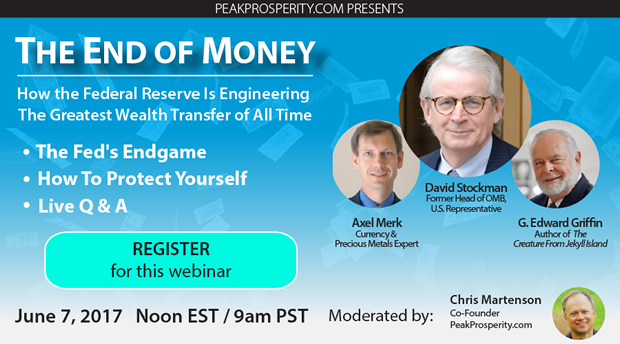 12:40pm to 1:20pm EST -- David Stockman will detail how control fraud is running rampant across the financial system. Through mechanisms such as financial repression, HFT spoofing & skimming, and regulatory capture. Those running the system are not working on your behalf to make it more fair, nor even to protect its future. They're robbing you, and are trying to fill their pockets by as much as possible as quickly as possible before the whole thing collapses. 1:20pm to 1:40pm EST -- Axel Merk will share his learnings from his recent time spent with past and current Federal Reserve regional presidents. He'll explain how the Fed's actions have created massive asset price bubbles that will be extremely destructive when they collapse. Similarly, Fed's actions have destroyed the incentive to save, as well as doomed pensions to insolvency -- creating a massive brewing retirement crisis. 1:40pm to 2:00pm EST -- Chris Martenson will take all the risk factors highlighted by the previous speakers and then add in additional data from the resources side of the equation. The net energy & natural inputs required to power the future economy are depleting -- providing more evidence that the Economy is in big trouble. 2:00pm EST to 2:45pm EST -- New Harbor Financial will address audience Q&A regarding the big question raised by the previous speakers: What should the concerned investor do? Risk management, hedging, safe haven assets, shorting strategies, tangible asset investments, and more will be addressed. A video recording of the webinar will be made available to participants after the webinar is over. That means there's no reason to worry if you can't make the live event, or need to skip out on parts of it due to meetings or other obligations. You'll be able to re-watch the webinar as much as you like. So if this interests you, register now by clicking the big blue button below. If this first webinar goes successfully, that will enable us to produce more of these 'gathering of great thinkers' for you in the future. We have great hopes for this new webinar platform, but how much we use it in the future will be a direct function of how many people like and attend these live events. So if you want more of these, please participate! And if there are other speakers you'd particularly like to see in a future webinar, please let us know by contacting us here.